Project Apollo for Orbiter ( formerly known as NASA's Apollo Space Simulation Project or short: NASSP ) is an add-on for Orbiter which recreates the Apollo missions. NASSP was originally developed by Jean-Luc Rocca-Serra, who released the source code to version 4.x. Mark Grant then rewrote the code as C++, added an initial C++ implementation of the Apollo Guidance Computer, and replaced the control panel bitmaps with new ones from P64. He subsequently released 'NASSP COSTAM' and a derivative which provided basic support for the Virtual AGC software. Jean-Luc released NASSP 5.0, an updated version based on that source code, for the next release of Orbiter, including, for example, new particle exhaust support and a Skylab launch module. With the 6.x release it became Project Apollo for Orbiter, an open source Apollo simulation add-on: for simplicity, both software variants are described here as NASSP. The latest 'stable' version is 6.4.3. The 7.0 release is currently in Beta, including a near-complete simulation of the Command Module control panel and most of the internal systems, and support for new spacecraft. It is also capable of flying most of an Apollo mission using the Virtual AGC software. As there is no definitive list of functionality changes between NASSP versions, many of these changes have been deduced from release documentation and test-flying of versions which are still available for download. Versions prior to 3.0 seem to be unavailable on the web. If anyone has a copy and can update this and/or add screenshots, please do so, or at least let us know what the differences are. Saturn 1b and ASTP support. Rewritten to use Orbiter docking support. NASSP 3.0 still runs under Orbiter 2006, with no modifications required. Control Panel for both Saturn V and Saturn 1b. Engine Gimbal control for all rocket stages, Service module and LEM. Totally rewritten Autopilot (a semi auto mode is available for engine control only). New Saturn V and Saturn 1b meshes. Optional high-res Saturn V and Saturn 1b meshes. New CSM and LEM meshes. Only high-res meshes supported for the Saturn 1b and Saturn V.
New control panels with illumination support from P64. C++ AGC implementation for launch and TLI. Rewritten in C++, to eliminate bugs and crashes due to global variable use. Revised launch autopilot for increased accuracy. Same functionality level for Saturn V and Saturn 1b. NASSP 5.x does not currently run under Orbiter 2006 as its Solar System files are incompatible with the new Orbiter format. It could probably be made to run with some changes to the config files. Rebuilt for 2005 Orbiter release. Initial support for unmanned Saturn test flights. More realistic Command Module aerodynamics. Or, more accurately, 'Project Apollo for Orbiter 1.0'. Fully functional 2D Panel Support throughout the CM. Realistic simulation of most major spacecraft systems. Full launch and landing autopilot for the LEM, and enhanced autopilot for the Saturns and CSM. Engineering camera views during launch. Realism settings to accomodate orbinauts from 9 to 92! Support for low-res Saturn 1b and Saturn V meshes as well as high-res. Partial Apollo 5 (unmanned LEM test) support. Service Module breaks up on re-entry, based on re-entry heating. Apollo 13 oxygen venting simulation. Project Apollo for Orbiter 1.0/NASSP 7.0 supports a number of spacecraft. Most are historical spacecraft used in the Apollo program, but some are proposed post-Apollo designs which never flew in the real world. NASSP simulates the Block II Command/Service Module, providing a home and life support for the astronauts in space. The CM was the nerve center of the Apollo spacecraft, as it functioned as primary control and navigation platform during the missions. It housed the highly-advanced (for the 1960s) Apollo Guidance Computer, as well as all the systems the astronauts would need to safely re-enter earth's atmosphere. The Service Module contained the systems that were vital for the extended stay of up to 10 days in space. This included fuel cells to provide power and water, as well as radiators to keep the internal systems cool. Also housed in the service module were the primary propulsion systems, including the RCS maneuverability thrusters and the SPS, used for major course corrections. In later Apollo lunar missions, this versatile component contained a SIM Bay for additional scientific study of the lunar surface the space surrounding our nearest celestial neighbor. As the core of the Apollo hardware, the CSM is a high priority for NASSP development. It has received a complete and ongoing overhaul for NASSP 7.0, complete with new graphics, meshes, and systems simulations. The Lunar Module was a two-stage lander used to land astronauts on the Moon and return them to orbit. The lower Descent Stage carried the large Descent Engine, fuel for the landing, and batteries and supplies required for the stay on the Moon. It also carried a limited amount of cargo, including, on the later flights, the Lunar Rover. Its final role was to act as a launch pad for the Ascent Stage when the lunar landing phase was complete and they flew back to dock with the CSM in orbit. The upper Ascent Stage provided living quarters for the crew while on the Moon, controls for the landing and ascent, and the smaller Ascent Engine and fuel to carry them into orbit. The Ascent Stage could dock with the CSM itself, but in normal circumstances the docking was flown by the more maneuvrable CSM. Whereas the CSM was the brain and body, the LM was the heart of the Apollo Program. A high priority has been placed on the development of the LM for NASSP. It is currently in line for new graphics and meshes. Work is already underway on its internal systems. The Lunar Rover was a battery-driven electrically-powered vehicle used by the astronauts to drive around the lunar surface. 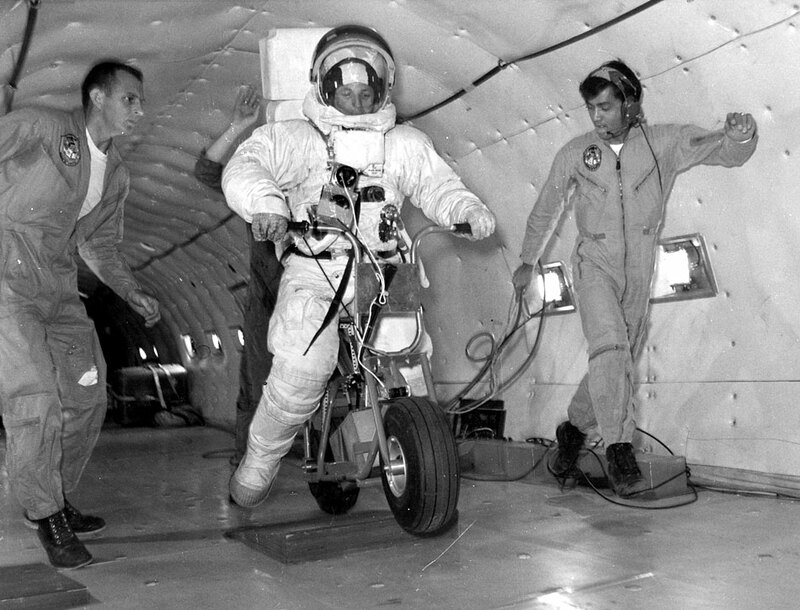 While hardly a Ferrari, it allowed the astronauts to travel longer distances much faster than they could on foot. The LRV was folded up in the side of the LEM during the flight, and removed and assembled by the astronauts after landing on the lunar surface. When the lunar exploration was complete, the LRV camera was also used to film the launch of the LEM Ascent Stage carrying the astronauts back to the CSM (though this isn't currently simulated in NASSP). NASSP's LRV has been overhauled with the inclusion of a VC mesh and several working instruments. New animations and more realistic hardware simulation (e.g. power usage for the batteries) are on the drawing board. Three-stage launcher used to launch a Command/Service Module and Lunar Module towards the Moon. This was used to launch Apollo's 8 through 17. It is arguably the most powerful rocket ever flown into space. The Saturn V in NASSP is a highly detailed and increasingly more realistic machine. Current development is minimal, as it has already reached a high level of detail and accuracy. Two-stage launcher used to launch a Command/Service Module into Earth orbit. This was used for Apollo 7, the Skylab flights, and the Apollo-Soyuz Test Project flight. Recent studies have shown that the Saturn IB may have been one of the most cost-effective boosters in lbs per dollar. Like the Saturn V, NASSP's Saturn IB is highly detailed and extremely accurate. As a result, it is not a high priority at this time. Although rather limited as a spacecraft in its own right, the Apollo-Soyuz Test Program Docking Module allows an Apollo Command/Service Module to dock with a Russian Soyuz spacecraft in orbit and transfer crew between them. The Docking Module is carried into orbit as cargo on a Saturn 1b, in the same way that the Lunar Module is carried as cargo on a Saturn V.
Development on the Docking Module is currently stalled as work proceeds on higher-priority items, however it is open to further development and will more likely than not see its share of upgrades. NASA's Manned Venus Flyby plans using Apollo technology would have used an SIVB stage to launch a three-man crew towards Venus, after which they would vent remaining fuel from the SIVB, extend solar panels, and live in it as a Skylab-style space station. They would conduct generalised astronomical and zero-gravity experiments for most of their trip, and for a few days around the flyby they would conduct detailed observations of Venus. NASSP 7.0 includes a simulation of the first test phase, in which the astronauts would use the SIVB to raise their orbit for a test of the 'wet workshop' of up to one month in duration. Rather than solar panels, the test phase uses batteries in the SIVB stage to provide power to supplement the Service Module fuel cells and conserve consumables in the Service Module for the return to Earth. Although not a historically real mission, this proposal from the Apollo Applications Program is an intriguing and exciting 'fictional' mission. NASSP is developing this capability both as a historical curiosity and as research/exploration into the feasibility of such a concept. Two-stage launcher used in a similar manner to the Saturn 1b to launch a Command/Service Module and larger payload into Earth orbit: essentially a cut-down Saturn V with no second stage, mounting an SIVB stage directly on top of the S1C first stage. The S1C also had one engine removed, as the five-engine stage produced too much thrust and would have caused problems with excessive dynamic pressure during launch. The primary benefit of the INT-20 was a payload capacity about half-way between the Saturn 1b and Saturn V without the cost of creating a new launcher from scratch: the stages were close enough in design that they could be built on the same production line as the Saturn V stages. A three-engine version with a lower payload was also studied, but isn't simulated in NASSP. Another non-historic craft, the INT-20 showed much promise on the drawing board and NASSP hopes to bring such promise to life in the virtual world. There are a number of candidates for future additions to the spacecraft simulated in NASSP. Phase B of the Apollo to Venus plan called for the addition of solar panels to the 'wet workshop' and the use of a Block III CSM so that the astronauts would fly the SIVB into a high altitude orbit for a year-long mission in preparation for an actual fly-by. Phase C of the Apollo to Venus plan would use an improved version of the 'wet workshop' SIVB with a Block-IV CSM to perform the actual Venus flyby. Wikipedia has some more information. Support may be added for the proposed Block-III CSM with batteries for power in place of fuel cells, and the Block-IV CSM with batteries for power and LEM engines in place of the SPS. In addition, the inclusion of a Block-I CSM in future versions has been discussed. Simple two-man rocket using fuel from the LEM. This could be used for scouting missions to sites up to around 50 miles from the main landing site, or, in an emergency, to carry two astronauts from the lunar surface to rendevouz with the CSM. See the Wikipedia article for more information. Designed as a backup to the Lunar Rover. See NASA image. The original Saturn-A, -B, -C, and Nova designs, possibly including the earlier lunar landing plans based on multiple launches, or the single launch putting the entire CSM onto the Moon using the massive Saturn C-8 booster. For more information see, for example, Saturn-C family and Nova family at Astronautix.com. A plan to use a mirror in space to light up parts of the Vietnam jungle at night. A modified LEM with a huge flexible mirror attached would be launched into space where the mirror would unfold. 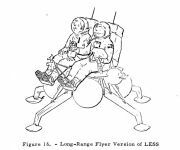 A similar plan proposed using a modified LEM to fly to Soviet satellites and spray paint over their sensors: effectively the first space vandals. Proposal to divert or destroy an incoming asteroid by launching 100 Megaton nuclear bombs on Saturn Vs. The Saturn 1 was the precursor to the Saturn 1b, using an SIV stage in place of the SIVB. The SIV was smaller, with a lower fuel capacity, and used multiple RL10 engines in place of the J2 engine on the SIVB. As part of NASA's cost-cutting plans, they studied a derivative of the Saturn 1b which would replace the S1B stage with a solid rocket similar in size to a shuttle SRB. In essence this was a 1960s version of NASA's new 'Stick' launcher for the CEV. Two-stage launcher used to launch large payloads into Earth orbit. This was used for the Skylab mission. A modified S1C stage which dropped the outer four engines in a similar manner to the Altas dropping two of its engines during launch. As well as multi-stage launchers with greater payloads, it could carry 50,000 pounds to low orbit itself with no second stage. Saturn V with stretched stages, new toriodal aerospike engines on the upper stages, uprated F-1 engines on the first stage, and four strap-on boosters with two F-1 engines each. Capable of putting over 500,000 pounds of payload into low Earth orbit. The NASSP 5.x Skylab sources were lost, so a new version will be required once the INT-21 support is added. NASSP has changed significantly over the years, as models, textures, and control panels were updated; historical accuracy was improved; and new special effects were added. NASSP 5.x screenshots are currently missing as it won't run as released under Orbiter 2006. This article has a precis and appears in the Random addon or Random article section on the Main Page. The precis can be found at Project Apollo for Orbiter/precis and is displayed below.